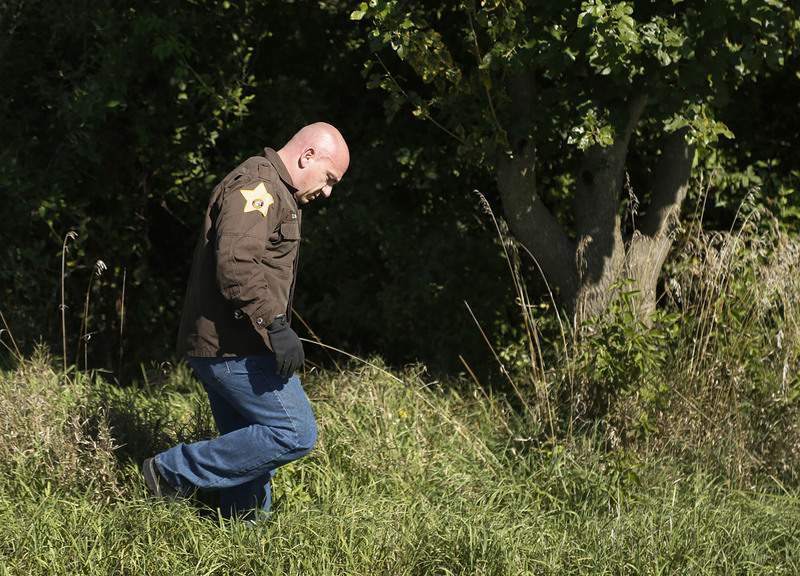 Chad Ryan | The Journal Gazette Allen County Sheriff’s Department Detective T.J. Hough searches a wooded area in the 6000 block of Wallen Road on Tuesday where Frank Macomber’s body had been found early Tuesday morning. 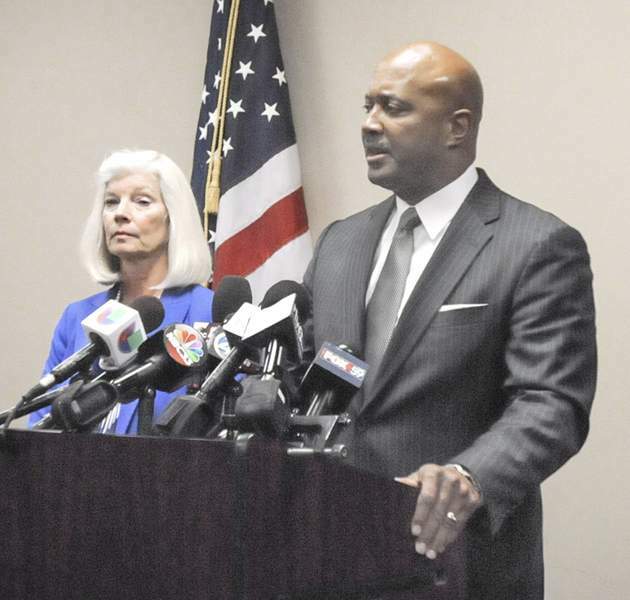 Michelle Davies | The Journal Gazette Allen County Prosecutor Karen Richards and Elkhart County Prosecutor Curtis T. Hill Jr. appear at a news conference in Fort Wayne on Tuesday afternoon. A Fort Wayne woman suspected of killing her two children, from whom she was estranged, was being held Tuesday in the Elkhart County Jail. Amber Pasztor, 29, will likely be formally charged in the deaths of Liliana Hernandez, 7, and Rene Pasztor, 6, Elkhart County Prosecutor Curtis T. Hill Jr. said Tuesday. She was being held on two preliminary charges of murder. The children, students at Arcola Elementary School in Northwest Allen County Schools, died from asphyxiation, the Elkhart County coroner said. 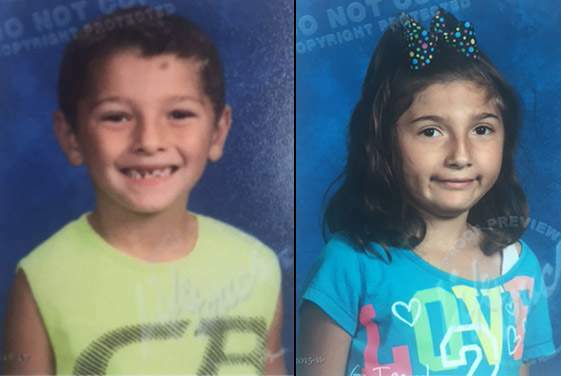 The Allen County Sheriff’s Department said Pasztor abducted her children from their grandparents’ home in the 7000 block of Goshen Road about 6 a.m. Monday. According to court records, her parental rights had ended. Pasztor turned up at the Elkhart Police Department about 5:30 p.m. Monday with her dead children in the car, Hill and Allen County Prosecutor Karen Richards said. The two prosecutors conducted a news conference Tuesday in Fort Wayne. An Elkhart police officer was walking outside when he was flagged down by Pasztor. She drove to Elkhart in a vehicle that belonged to Frank Macomber, 66, of Fort Wayne, Hill said. The Allen County coroner’s office said Macomber was found about 1:40 a.m. Tuesday, dead of a gunshot wound, in woods near West Wallen Road in northwest Allen County. His death was ruled a homicide, the 37th in Allen County this year. Richards would not comment on possible charges against Pasztor in Macomber’s death, but Hill said Pasztor gave information that led to the discovery of his body. 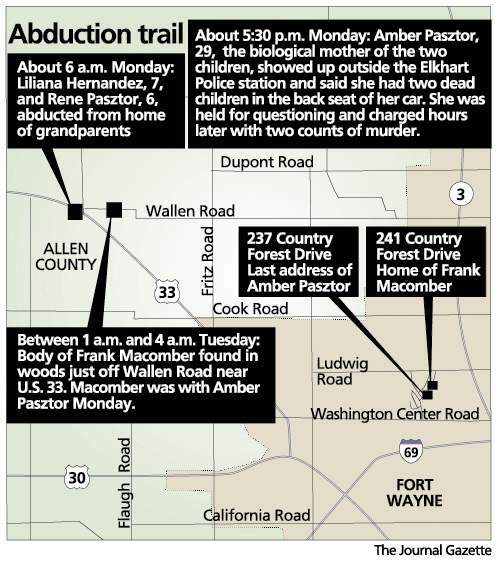 Macomber was a neighbor of Pasztor at Countryside Village, a mobile home park on Washington Center Road in Fort Wayne. On Aug. 2, she was evicted, according to a notice on the door. Richards said Macomber and Pasztor had "some type of relationship, but we’re not sure what it is." Richards and Hill said they believed Macomber’s death occurred before the two children were abducted. Hill said the police officer who was led to Pasztor’s children was "traumatized" by the event. Richards said the Amber Alert issued for the two children Monday came a few hours after their abduction because of procedure. Police must have a description of the motor vehicle and abductor in order to file an Amber Alert, she said. The two prosecutors were asked but declined to say whether drugs or mental health played a role in the children’s violent end. However, Hill said Pasztor might have been taken to a hospital after she turned herself in. The children’s father, believed to be Rene Hernandez, was found dead in a wooded area in Whitley County more than six years ago, according to Whitley County Sheriff Marc Gatton. When a landowner found him in January 2010, his hands were duct-taped behind his back. Pasztor, who was pregnant at the time, was identified as his girlfriend, Gatton said. She was interviewed twice and then the case went cold, he said. "I’m sure we’re going to be sending someone to try and speak with her," Gatton said Tuesday.